UB40 is a super-concentrated washing-up detergent, which is fragrance-free and contains an advanced blend of cleaning agents. 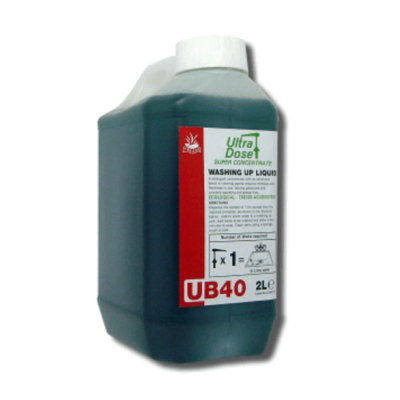 A thick, green liquid with a high foam level, UB40 is designed to be used through the Clover Chemicals Ultra Dose system for washing up by hand. Suitable for use on all crockery, cutlery, glassware and utensils. Ideal for use in all catering establishments, e.g. cafés, canteens, restaurants, school kitchens, etc. Sold in 2 litre bottles.